This morning, as you open your Bible to 1 Peter 2:4-8, you are going to feel like a phone call has been dropped. Have you ever had an important phone call drop? Sometimes to prevent that agony, because we have a cement tile roof, I actually have to walk out my front door and go sit on my front curb in order to finish an important conversation so the call doesn’t drop. We all feel the tension–unless we hear the entire conversation, misunderstanding and confusion are inevitable. And today, when we are done, you will want to hear more. You will want to pull Peter aside and ask more questions. You will want to hear the rest of the phone call! Hopefully today will lead to further study, healthy dialog, and awesome worship of a God who is in control. Though the issue of God’s sovereign electing purpose in salvation is a Biblical doctrine, it has also been a difficult truth for believers for 2,000 years now, so we might not answer all your questions today. But we will exposit what Peter says in verses 6-8, and hopefully embrace a God who cannot be fully understood, and worship a God who cannot be contained in our mental box, and adore a God who is bigger than we can imagine. Peter again affirms God’s sovereign control in verses 6-8, but he is not going to give us the entire conversation . . . why? Because Peter is not primarily talking to you, he’s encouraging Christians who’ve been beat up for their faith–they’re on the run, pushed out of a comfortable home into a life-threatening region. The fact that they’ve been treated unfairly is not evil or bad. Their difficult circumstances are actually God’s perfect will. When we send missionaries to life threatening places, that is not evil, that is not bad, that is not less than best. I say this to you and me. Get it through your comfort-loving head–this entire world is bad and evil everywhere . . . not just Saudi Arabia, or Hemet. Just because we are not attacked for our faith yet, does not mean this region is a better place to live. When we live for Christ and heaven, no matter where we live here on earth, the location is temporary and evil. It’s all the same. Our current location is as significant as being on the bow or the stern of the Titanic . . . it’s all gonna’ sink. Some places sank a little slower . . . they were safer–some sank a little faster . . . they were more dangerous. But the entire ship sank, no matter where they were on it. The faith of these Christians was offensive to their new region and they were being abused and were struggling. The most important word they needed to hear was this–your God is in control. And a reminder they were in Christ which means, if He suffered, they would suffer. The more you understand who you are in Christ, the more you will be able to not only survive, but thrive in difficult times. A few of you here are car people–you know how to repair them, fix them, rebuild them, even make them look cool. I have a friend who is a car guy–he builds them, maintains them and drives them around–he’s cool. I am not a car guy, never have been, and probably never will be. Therefore, I buy cars for the cheapest price I can get them, but I buy cars that will last for a long time. We bought two Civics and drove them both for almost 20 years each. Saved a lot of money and time because I know I’m not a car guy–it helps me to make wise choices. I don’t try to be something I am not. I know my identity–“Mr. No Repair Guy”. Knowing who you are in Christ and His church also helps you make wise choices. Last week in verses 4 and 5, we learned . . .
Verse 4 “And coming to Him as to a living stone which has been rejected by men, but is choice and precious in the sight of God.” Christ is a living stone, rejected stone, a choice and precious stone. We are also living but rejected stones, who are choice and precious to God. Verse 5 “You also, as living stones, are being built up as a spiritual house for a holy priesthood, to offer up spiritual sacrifices acceptable to God through Jesus Christ.” Like Herod’s Temple of stones, as a Church body we together are to reflect Christ, represent Christ, and be like a house where the Spirit is manifested and become a place of worship. Now in verses 6-8, the Spirit of God working in the mind of Peter does something unique, as He continues with His temple illustration. 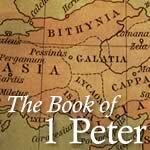 Peter teaches what we see taught in the rest of the New Testament. God is Sovereign, but people are still responsible. God is Sovereign, but we are responsible! Peter makes this really clear in verses 6-8 . . .
As I read, listen to verses 6 through 8 and see if you can hear the distinction that Peter is making between those who are in Christ and those who are not–between those who believe and those who disbelieve–between those who obey and those who disobey. If you are into cats, you’re typically not into dogs–distinct. If you love the Raiders, you’re typically crazy–you are distinct. If you are a Democrat, you’re not a Republican–they are distinct. And Peter says, if you believe in Christ, you will be distinct from those who disbelieve Christ. Today, preachers have confused the distinction between a Christian and a non-Christian, but Peter here makes it really clear. Jesus is the decisive pivotal turning point of all of human history. Jesus Christ is the fork in the road for everyone that exists. Everyone either pursues Him, or rejects Him. Period. Peter is an inspired writer of New Testament scripture, but in verses 6-8 he appeals to Old Testament scripture as the living and abiding Word of God. He starts in verse 6 with, “For this is contained in Scripture.” That phrase is used 51 times in the New Testament, and every time it points to the Old Testament as the Word Of God. It never points to the apocrypha, never to a false gospel, only and always to the 39 books of the Old Testament. Then Peter quotes Isaiah in verse 6, “For this is contained in Scripture: ‘Behold, I lay in Zion a choice stone, a precious corner stone, and he who believes in Him will not be disappointed.” Peter uses Isaiah 28:16, where God promises He’ll reject the current leaders in Jerusalem and establish a better, more permanent leader for all time. God acted directly to establish Christ as a choice and precious cornerstone who will be the foundation for all who believe! The temple cornerstone was massive: 40 feet long, 13 feet high, and 10 feet wide, weighing over 400 tons. Ancient cornerstones controlled the location and alignment of the walls of the building, were the first stone laid down, and in many ways, ultimately bore the weight of the entire building. And God says in verse 6, “behold” or “look”–pay attention here. “I lay”, literally it is “I” God who “set”, or I “appoint” in Zion (another name for Jerusalem) a choice and precious cornerstone. I appoint Christ for the task of being the cornerstone. Underline the word “lay”. In verse 6, the word “lay”, he lay in Zion, means to place or appoint. The very same Greek word in a different form is also used at the end of verse 8, when Peter says they were also appointed. Underline the word “appointed”. Appointed in verse 8 is the same root word for “lay” in verse 6. By using those words lay/set and appointed, God is describing His electing purposes–God elected or set Jesus as the cornerstone in verse 6, and appointed unbelievers in verse 8 in their disobedience. When Peter speaks of those who are elected, He also speaks of those who have believed. Both truths are taught side-by-side in the Scripture, and both are necessary. Believe is the same basic word for faith, and Peter clearly is describing continual, on-going belief/trust/faith. The phrase believes in Him is literally, believes on Him–the image is someone who is putting all their weight on another, like believing your chair will hold you, so you’ve put all your weight on it. Like stepping onto an elevator and trusting it will not fall. 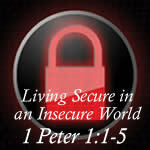 Peter is describing someone who no longer trusts in themselves, but has completely surrendered to another. What happens when you do? All those who believe on Jesus, verse 6 “will not be disappointed.” Disappointed literally means put to shame, confuse, or dishonored. We will never be ashamed, because we are completely forgiven and ready for future judgment, we will stand in Christ’s righteousness. And true believers will never ultimately be dishonored (or disappointed), because we will be vindicated in the future. You have shared this truth with family, friends, classmates and some have rejected you. In reality, they have rejected Christ because someday soon, when Philippians 2:10-11 happens, “at the name of Jesus every knee will bow, . . . and that every tongue will confess that Jesus Christ is Lord, to the glory of God the Father.” Then believers will bow and be accepted by Christ forever in heaven, unbelievers will bow and be rejected by Christ forever in hell and on that day, the disbeliever will know that the believer was right. I have shared the Gospel and in the middle of sharing I get embarrassed. You have too. But there’s no need to be ashamed, because you are set for coming judgment, and in the future your faith will be vindicated–they may reject you now, but someday they’ll know you were right. Now check out verse 7–“This precious value, then, is for you who believe.” Verse 6, “For those who believe,” verse 7, “Christ is precious.” This is the third time the word “precious” is used in some form in verses 4-8. It simply means this–Christ to you is so high in your thinking you cannot help but give Him highest honor, esteem and respect. Being precious, Christ is ranked so high in your heart, you would do anything for Him, and you show it by your continual obedience. Being precious means Christ is so valuable to you, that there is no comparison between your love for Him and your love for your children, your spouse, even your own life. Do you find it easy to drift from this kind of love for Christ? You let routine replace relationship? You allow church to replace Christ? You focus on doctrine and neglect deity? You lose your first love like the Ephesians did? If so, Revelation 2:5 gives the cure–if you’ve lost your first love, then remember from where you have fallen, and repent and do the deeds you did at first, or else I am coming to you and will remove your lampstand out of its place, unless you repent. Back then, you never missed church, you served Him passionately, gave to Him selflessly, hungered after Him like you were starving–repeat that again. So Peter says back in verse 7, believers are to honor Christ as their precious highest value. And unbelievers reject Christ as having no value, which is how Peter continues in verse 7. Now in the middle of verse 7, he describes the disbelieving–Christ is not only the foundation for believers, but also . . .
Peter quotes Psalm 118:22, describing unbelievers. Jesus used this Old Testament quote to describe the Pharisees and scribes in Matthew 21, and Peter quoted it earlier to describe the Jewish leaders in Acts 4. The religious leaders rejected the very one who would become the great divide for all of humanity. And Peter actually calls Jesus here the chief cornerstone. When he says in verse 7, the very cornerstone, very is the Greek word for chief, leader, headship–the main dude! It would be like you throwing out a giant chunk of glass in the trash, only to find out later it was the largest diamond in the world. Sadly, rejected means they tested Christ, examined Him carefully, but declared Him useless. They missed it, because they missed Him. By saying Christ was rejected, yet became the chief cornerstone, Peter is telling us this: to not surrender to Christ is like losing the forest for the trees, blowing through a red light. Christ is the center of the Church, and the turning point of all of history. Miss Him, and you’ve missed the reason you’re here. You missed your purpose for existing. Unbelievers were really making it tough for these Christians. They were attacking churches, and believers were suffering. And these unbelievers were rejecting Christ. So what affect does their rejection have on the purposes of God? Nothing! Here’s the key. Their rejection does not defeat God’s plan. This is so good! If you believe on this cornerstone Christ, you can’t lose. If you disbelieve on this cornerstone Christ, you can’t win. Human unbelief does not frustrate the ultimate purposes of God. If God plans for Christ to be the chief cornerstone, humans can betray Him, desert Him, deny Him, mock Him, strike Him, spit on Him, hit Him, crown Him with thorns, strip Him, crucify Him, bury Him–but they cannot stop Him from being what God destined Him to be, the living cornerstone of a great and glorious redeemed people. Peter is telling them and us, disbelief does not defeat God! Peter continues, and this is difficult to read because Christ is the most wonderful, loving, gracious person I know, in verse 8–“’A stone of stumbling and a rock of offense’; for they [unbelievers] stumble because they are disobedient to the word, and to this [doom] they were also appointed [set].” (Bracketed words not in text) This now raises the question of election and the idea of double predestination. Does God elect those who are saved to heaven? YES. Does God choose for those who are unsaved to go to hell? If so, that would be double predestination. Look at what verse 8 actually says. Christ is a stone of stumbling–you’ve done it, you’re walking down a path and trip on a stone and fall flat on your face. Christ is the one that trips people up. They can’t believe they are so sinful to the core of their being that they need Christ to rescue them. And Christ is also a rock of offense–this is the rock bed that was used to crush other rock–smash it there. And offense was a word used to describe the trigger stick that releases a trap. In other words, once you trip over Christ in rejection, Christ becomes the trigger that results in their ultimate judgment. Talk about a scary turn of events–the very person they reject is the actual one they will have to answer to in the final judgment. The rejected one, becomes their judge. What a sad surprise! Then the next phrase in verse 8, “for they [unbelievers] stumble.” For they (the disbelievers of verse 7) as a fact continually choose to stumble. They are in an ongoing pattern and lifestyle of tripping over Christ. How do we know that? Peter adds, for they stumble because they are disobedient to the word. They prove their rejection by their continual disobedience. Continual disobedience to any command of Scripture is a scary place to live, since it raises the question of your salvation! 1 John 2:4, “The one who says, ‘I have come to know Him,’ and does not keep His commandments, is a liar, and the truth is not in him.” But that is not what Peter says here. Peter says they stumble because they are disobedient to the Word, the Greek word for “Word” here means “gospel message.” The same word is used later by Peter when instructing believing wives who are married to unbelieving husbands. 1 Peter 3:1, “In the same way, you wives, be submissive to your own husbands so that even if any of them are disobedient to the Word, they may be won without a word by the behavior of their wives.” A Christian wife wins her unbelieving husband with her behavior! His disobedience to the Word here means he’s rejecting the Gospel. So Peter is telling us that disbelievers show they are continually rejecting Christ when they are disobedient to the gospel message. That’s the good news of how Christ took the punishment for our sin. How do you disobey the gospel message? By rejecting it. How does one obey the gospel message? By believing it/owning it! The people in verse 8 are those who did not believe Jesus Christ is the way, truth and life–the only way of salvation, the only truth that leads to heaven, and the only path to eternal life. Wake up and be certain–there is no lukewarm Christian, you are either hot or cold, and if you are not hot, but thinking that you are saved, you are in a scary place and your calling is not sure. There are no uncommitted Christians, all true believers will willingly sell all they have, do anything for Christ, even die for Him. There are no partially obedient Christians, who decide they will claim Christ, but also pursue their pleasures, and partially obey the New Testament commands to gather, give and serve, but ignore the commands to not slander, not speak ill, not gossip, not presume and more. No genuine Christian obeys in every area, and every true believer battles with sin–but genuine Christ-followers never embrace a partially-obedient lifestyle–never. You had better make your calling sure. Christ is the great unavoidable rock who you build your life upon or stumble over. If you don’t meet Him by His grace, you will meet Him in His judgment. If you don’t come to Him by grace, you will try and fail to earn your way by works. He alone is the stone people trip over in this life, but in the next life He will be an impenetrable wall that prevents them from entering heaven. So Peter tells us that unbelievers trip over Christ because they disbelieve the gospel. Now look at the end of verse 8 (and here comes a difficult phrase), “and to this [doom], they were also appointed.” What’s the “this”? It is their disobedience. They were continually disobedient to the Gospel and to this disobedience they were set–appointed–“dropped call”. Alarm, whoa baby. Remember Lost in Space, “Danger, Will Robinson”? You mean they were appointed to disobedience? Therefore, they are not responsible for their sin? Is this what the NewTestament teaches? Therefore, Peter is not saying here that the ungodly are appointed to be ungodly, but being ungodly, God appointed that their disobedience should be fully manifested in their rejection of Christ. In other words, God does not actively destine people to unbelief, but He does appoint judgment on every unbeliever. Now why is Peter telling us this shocking truth? He wants to stress the fact that unbelief can’t win–unbelief cannot frustrate God’s ultimate purpose. By saying, “to this they were appointed,” Peter is encouraging abused believers by reminding them they’re on the winning side. They may hurt you, even kill you, but you are set in Christ, and their actions will not negatively affect God’s plan. If any unbeliever should boast and say, “I have chosen my own destiny, I am going to disbelieve to show God I have the final and ultimate say in my life–I have the power of self-determination. I can frustrate God’s purposes with my choice. Peter says, “No, you can’t–you only think you can.” But you’ll discover that whenever you choose–and mark it, your choice is real and crucial–but whatever you choose, you were appointed. God, and not man will have the final say, no mere human can thwart the ultimate purposes of God, not by belief or unbelief. Remember, this is a temple illustrating Christ and His Church; and Peter says no human choices can destroy the Church. People can reject Christ, the precious cornerstone, but if they do, two things are still true . . . These Christians have been abused, hurt and attacked by unbelievers, but those unbelievers can’t stop God’s plan! God is triumphant in our belief or unbelief, in our obedience or disobedience, in our accepting or rejecting. So what is Peter actually saying at the end of verse 8? Peter uses the present tense in three key verbs here for a crucial reason. For those who are presently not believers–who are presently stumbling, because they are presently disbelieving the gospel–by using continual action, Peter is keeping open the possibility of repentance and saving faith. They could still one day be saved. If they are currently rejecting, there is still an opportunity for them to repent, just like you did, and just like I did. At one point, you were presently not a believer, continually stumbling over Christ by continually disbelieving the gospel. But if they remain a rejecter, it demonstrates that their present rebellion and disobedience was where God left them. The text doesn’t tell us how or why, just that ultimately even the condemnation of unbelievers will result in greater glory to God. There is no conflict, tension, or difficulty in the words of Christ here–God is Sovereign and man is responsible. Both truths are stated by Christ in John 6. But how does this work? Look at Acts 13:48, and notice how God’s sovereignty and man’s responsibility are listed in the same verse with no tension and no conflict. “When the Gentiles heard this, they began rejoicing and glorifying the word of the Lord; and as many as had been appointed to eternal life believed.” Look at Acts 16:14, “A woman named Lydia, from the city of Thyatira, a seller of purple fabrics, a worshiper of God, was listening; and the Lord opened her heart to respond to the things spoken by Paul.” Do you know what God is telling you? First Stop thinking you are going to figure this out. They’ve been struggling with these truths for 2,010 years, and you are not going to be the one who resolves the struggle. Second Don’t try to determine if you are elect or not. Just turn to Christ in repentance and depend on Him in faith. Heaven is by grace alone, but hell is by works alone. And those who reject Christ have to work their way past the love of Christ for them, expressed in the Gospel of Christ. God never says, figure out if you are elect–He does say, Matthew 11:28, “Come to Me, all who are weary and heavy-laden, and I will give you rest.” Don’t try to understand so you will believe–turn to Christ in belief so you will understand. Third If you call yourself a Christian, make your calling sure. There are no lukewarm Christians, uncommitted Christians, and no partially obedient Christians who are certain of their calling. Today is the day to repent and walk in dependant obedience. Stop messing around, stop playing church, and stop excusing sin. Fourth Kill your pride and worship a God who is bigger than you. God elects, He alone draws, and invites anyone and everyone to believe, and if you want that to make total sense to you, you are trying to make God fit in a box. Our response should not be questioning, our response should be worshiping. After explaining God’s sovereignty and man’s responsibility in Romans 9-11, Paul ends with verses 33-36.